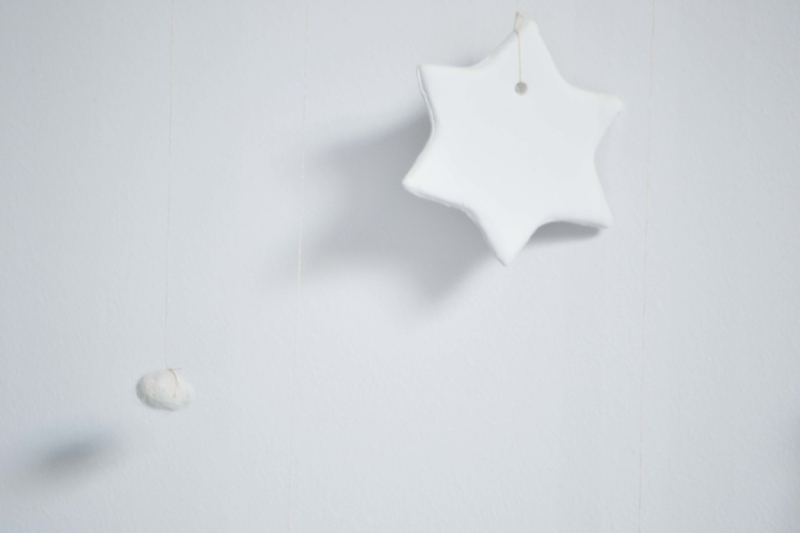 This simple wall hanging with white stars will look great in any bedroom. As a plus it is super simple and fairly quick to make. To make the stars simply roll out the clay (about 4 mm thick) , use a star shaped cookie cutter (I wrapped mine in some glad wrap as the cookie cutter shouldn't touch the clay if you intend to use it for baking again in the future). Make sure you also poke a hole at the top of the starts so you can attach them to the string later. For my wall hanging I made 2 large and 4 smaller stars. Once you have the stars cut out put them on a baking paper lined tray. Bake the stars as per instructions on the packet. Once the stars are ready you can simply tie some string on each one and hang them as per your liking on the branch. With the felted cotton balls simply use a needle and thread to go through the middle of each felt ball and then tie a knot. Hang the felt balls in between the clay stars. To finish it off simply tie some ribbon on each branch end and you are done. I have paired my wall hanging with some branches that have a couple of felted wool balls attached.